Well, Athma is not the only person speaking... Got a new BOSE headset and experiencing sounds that i have never heard before. You got to listen to BOSE when it speaks... And you would !!! 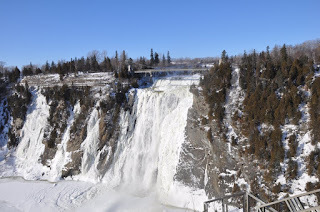 This time it is the turn of Mont Morency falls followed by Quebec city in temperatures less than -20 Degree celsius. 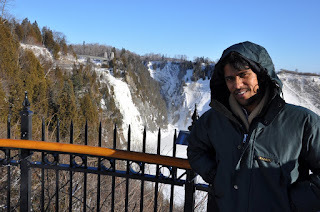 What came as surprise was that it was the same guide who had shown us Niagra falls. The same one who derives enormous pleasure in cracking jokes which are beyond the comprehension of normal human beings.. We decided to have some fun this time. And we were not alone in this effort - we were supported by a Florida university grad(Remember 'One of those cute passengers' !!!) who was also travelling with us in the last row. We started laughing every time he laughed - be it in Chinese, French or English. And we were the only ones apart from him who laughed !!! This really made our journey easy. 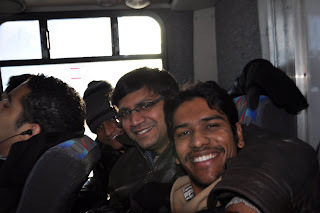 Each of his laughs were followed by a burst of laughter from the last row of the bus... This blog is a tribute to him !!! 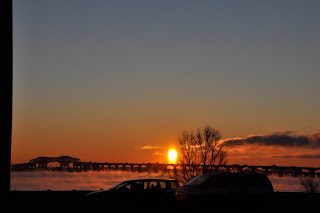 We finally reached MontMorency without the knowledge of freezing temperatures on top. 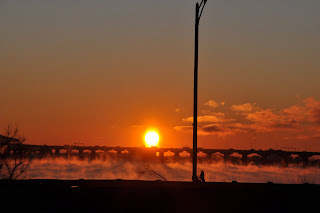 We were certainly aware that it could be cold, but the intensity was something which not anticipated by anyone. 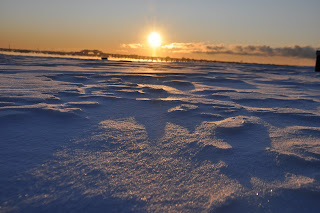 But it turned out to be a really pleasant encounter with the typical Canadian winter. Time for some photos at the falls. 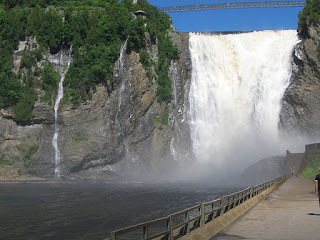 MontMorency falls is relatively unknown outside Canada but is much higher than even Niagara falls (Niagara is known for its width, whereas this one is for its height). Though we could not see it in full flow as it would have been during summer, it certainly was a pleasant surprise for us. Now it was time for us to leave for Quebec city. 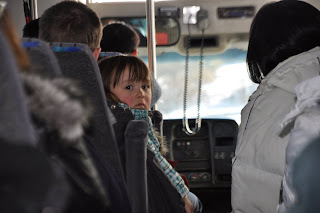 But we were relieved totally when we saw one passenger who came to the spot where we were waiting. We had come too early as we were not told the time to return and hence all the ensuing drama - We should not have made so much fun of our guide !!! 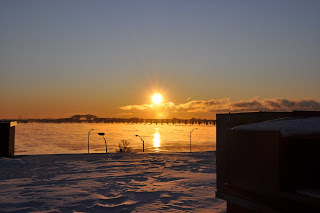 Some clicks from our Montreal office early in the morning... YENJOY !!! Mount St Bruno - My First Ski !!! 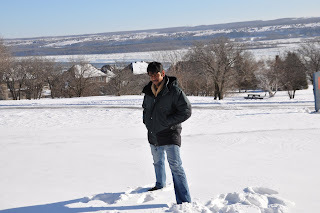 Skiing has never been on my to-do list and hence came across as a really pleasant experience. case we might find somebody who is able to coach us in english. We start off.. Two changes of metro line, then a bus for forty mins and followed by taxi for about ten mins - We reach Mount St Bruno. 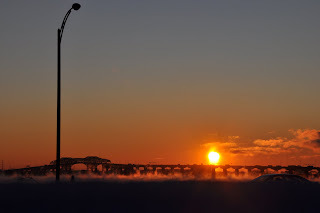 The temperature is sub zero. We are informed what we had heard the other day - no coach available in english. So we decided to go around the place and click some snaps. 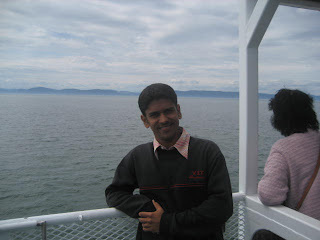 All the while, i have been mentioning "We" - it stands for me and a colleague Prasad. Now came the decision that taught us something really important. 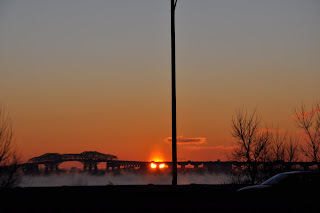 ten mins for the taxi", "It is not as chilly as the thermometer may show", "The frequency of buses would be just like what we have in Montreal" etc. 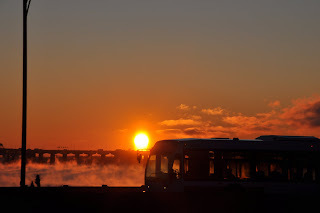 typo) is certainly NOT easy, bus frequency may not be as good in remote areas (what a silly assumption we had earlier...). Finally, the bus arrives - after the long arduous wait - and brings with it enormous amount of relief to our chilled-out souls(YES, the chill had penetrated IN). We could not believe how a bus, that would have been negelected under normal circumstances can bring this much relief. At that very moment, i remembered something that is taught in all B-Schools - "IT DEPENDS" - Every experience depends on the circumstances and a whole bunch of variables that define the time that we call "present". we left with a feeling that nothing could go wrong. getting a British accented guy was a bonus..
We start our lessons and realy enjoy being on snow. This is something we had only seen in Bollywood movies earlier. We enjoyed each of those moments we spent skiing (and also those when we fell). Suddenly, we see snow fall and we got to ski in snow fall too.. We could not have asked for more. And just as Paulo Coelho says in 'The Alchemist' - "When you want something, the whole universe conspires to make it happen". 'Plus tard tu comprendras'(French) translates to 'One day you will understand'..
A French Movie directed by Amos Gitai. It is an intense film based on the Genocide of jews by Germany during world war II. It is a true story based on autobiography of Jerome Clement. Rivka (Jeane Moreau)'s jewish parents are forced to abandon all their belongings in Paris to save themselves from getting killed in a concentration camp. They hide somewhere in France for some time but soon their traces are not found anywhere. a real hoarse voice to give the impact of those intense dialgoues..
Victor finally suceeds in his attempt at unravelling the past. But, in the process, learns why his mother had been silent all the while. No frills, intense movie which is more like a documentary rather than a commercial film. Recommended for intense-movie/Documentary lovers only !!! And the weekend travails continue... Jumping from 10,500 feet is no joke and i realised just that this weekend. Thrilling, breathtaking, exhilarating, adrenaline gushing experience. The day begins with a 100 dollar bill to the taxi to reach the venue - all just because of some careless useless planning by me. Just when i think that this is going to be a bad day, the sun gods appear from nowhere and change the mood altogether. The rains in the past few days could have spoilt everything. So, the platform was being set for a perfect beginning to skydiving. I reach the venue on time and am told to fill up a form that is only two pages long but is full disclaimers. Felt no point in reading it as i had to sign in any case if i had to take the jump. Now it was clear, whatever happens - plane crash, parachute not opened, heart attack, or any other remotely related medical illness - I AM RESPONSIBLE FOR MYSELF!!! That makes it easy... Well, not really. Now that the form is signed (with initials at every second line), i am introduced my guide Donald who is going to be taking care of my life for the next twenty mins or so. I think i should be able to find his name somewhere in my Kundali (horoscope) as he has every possible chance of changing my future altogether. Well, he is twenty years into the job and the probability of him screwing this up was very remote. That makes me comfortable. 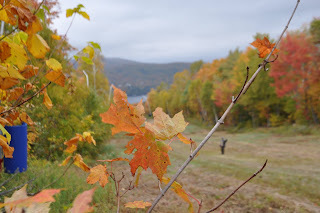 We start the ascend and somewhere around 4000 feet i try to re-confirm my postures with Donald and he ignores it saying that we would have a briefing just before we get out..
We ascend some more - the maple trees look beautiful with colours spilled over them. The view gets hazier and you are hardly able to see anything now. Just as i realise that, Donald tightens my hook with his hook and starts giving me instructions. Fold your hands across your chest when you leave the plane and open them when i tap twice. Just before we open the parachute, ill tap again and you have to fold your hands again. And just as i try to visualise the scenarios, he tells me to kneel down at the gate. We are the first to go !!!! No time to fear !! Only later did i realise that this is actually a great strategy to minimise fear - Give very little time to think. You are standing at the gate of an aircraft at 10,500 feet - about to take a free fall that is going to last for a minute. You would be going down at 200KM PH during this time.. That sums up the entire experience. Just as i look down and try to convince myself that i can do it, Donald tells me to pose for a photo. I feel like telling him, "Boss, this probably is not the best moment to pose for a photograph.." He turns my neck around so that i can give the cameraman (Andrew) a reason for him being there with me all through the jump. We pose for some photos (the camera man follows you) and now it is time for opening the parachute. Donald signals the cameraman and suddenly you feel a jerk at all the places where the rope was tied on to you. I insist on taking control of the parachute. Donald agrees as we were still quite long from landing. Controlling the parachute is a great feeling in itself. You feel as if you are flying and you take turns and increase speed etc.. This experience is something which may not have its impact with words.. You really need to experience it to feel it.. Dont miss it if you do have an opportunity !!! Back to maple leaves, they are pretty famous here in this part of the world and people from far off come to this place just to see them. Nothing else there other than that.. of course, there are some rides which you can enjoy.. But, we were content with the trek and were back just on time for our trip back to Montreal. No need to mention, we were again travelling by 'Wonder Travels'.. !!! Let me see what i can plan for the coming weekend !!! 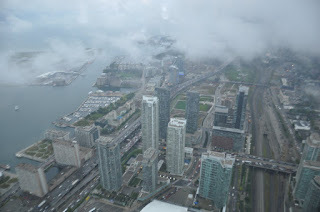 It was Toronto where we were supposed to stay for the night. 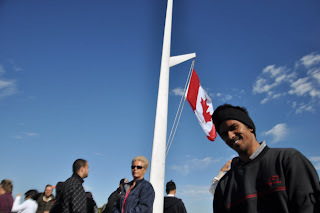 It was quite some time since i saw crowded streets and traffic jams and Toronto made me recollect just that. Very metropolitan and loads of people. It was a Saturday and our timing couldn't have been better to see people.. 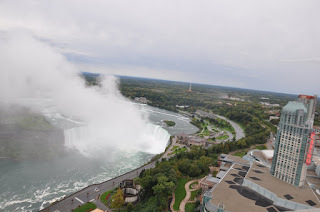 Went to our comfortable rooms at Hilton to for the night and were awaiting the next day when we would be at Niagara.. Early in the morning, we start towards Niagara - about an hour from Toronto. And, finally we reached. One more tower at Niagara - this one is called the Skylon tower (on the Canada side) - which gives a breathtaking view of Niagara. I have heard that Niagara looks better from the Canadian side and that was probably true because the view just extraordinary..
Now, it was the turn to take "Maid of the mist" to reach the base of the falls.. We are given a thin raincoat so as to save ourselves from the mist that is created by this gigantic waterfall.. 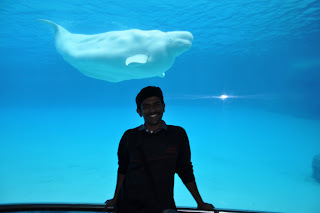 Finally, the last stop of the trip was Marineland - an aquatic museum which has trained whales, dolphins etc. It also has an underwater view which is quite good for a first timer like me.. 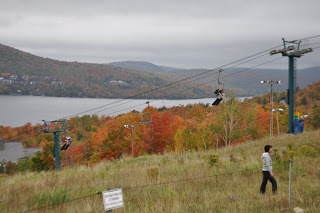 It was time to head back to Montreal after a hectic but lovely two day trip..
Mont Tremblant follows in the next blog..
Been a long time since i wrote.. 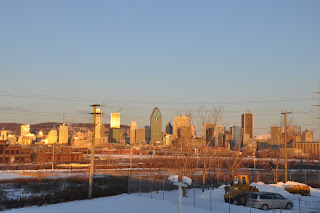 I am back and hopefully for a continuous stretch of writing..
My first blog since my visit to Montreal..
Lovely, Vibrant City... Montreal !!! 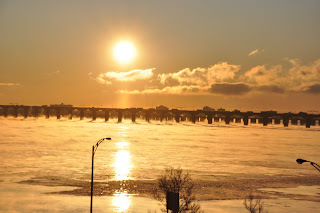 There would be detailed listing on the culture of Montreal once i figure out the nitty gritties of this wonderful city. This one is dedicated to the whales in arctic ocean near the East coast of Canada.. 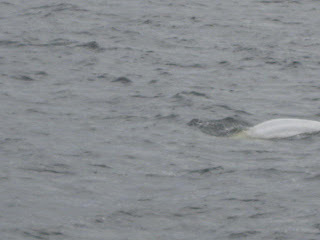 Though I could not get a complete glimpse of the 'Bowhead whale',i could still get a clear view of Belugas (baby whales).. The bowhead whale made its presence felt once when its huge fin splashed on the surface of the Ocean.. We were not allowed to get close it as a team of observers (probably Discovery or Nat Geo) were following it in smaller boats. The journey begins at a Chinki travel company near Place d' Armes metro station, Montreal. 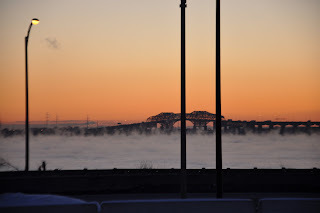 Four hour drive and we reach 'Riviere du loup', the base station for our Voyage into the arctic ocean. In my usual ignorance, i forget to take warm clothes with me. 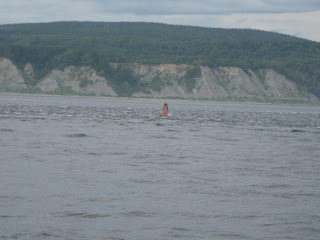 Of course, i realised it - When we were into 3 degree celsius arctic waters. 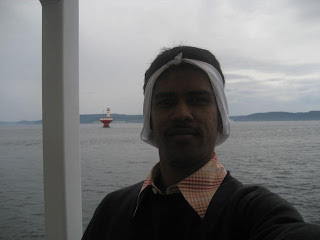 The only savior was my hand kerchief which found its best use. 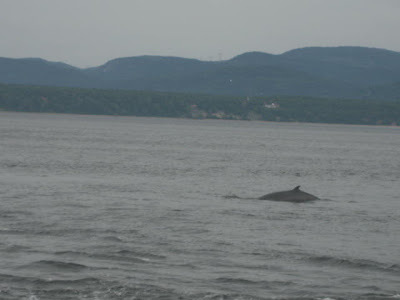 We were nearing the spot where whales are usually spotted.. Everybody on their guard.. No sighting as yet. 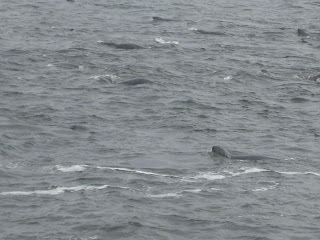 All we got to see was a group of seals.. :-) The whales were still eluding us. 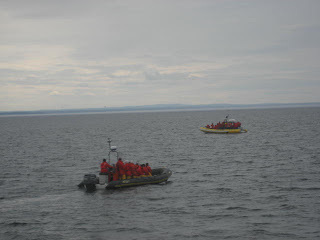 The photos have not come out as great and hence the need for a better camera next time... Have to do some research..
Then comes the grand finale.. We were on our way back and then suddenly, the huge Bowhead whale splashed its fin at a distance. Soon, the observing teams begin chasing it and it vanishes into the vast arctic.. In any sighting of this sort, luck plays a very important role.. Might be back again to try my luck for a better view of the larger whale next summer..
Until then, back to business Ooops work !! !